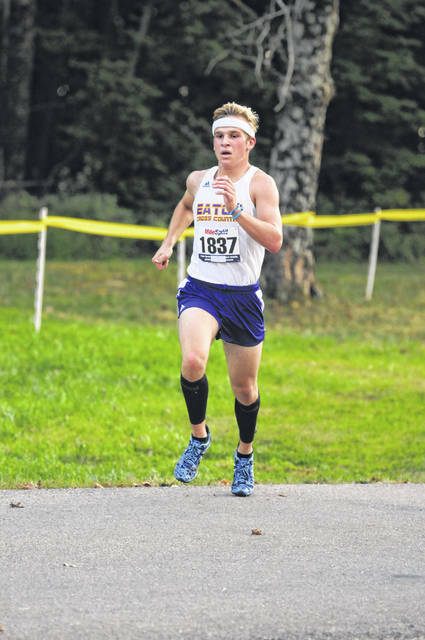 Eaton’s Alex McCarty placed first at the Preble County Cross Country Championships on Tuesday, Sept. 18. The Eagles placed nine runners in the top 10 win the meet with 17 points. Eaton’s Allison Mowen placed first at the Preble County Cross Country Championships on Tuesday, Sept. 18. The Eagles placed nine runners in the top 10 win the meet with 16 points. 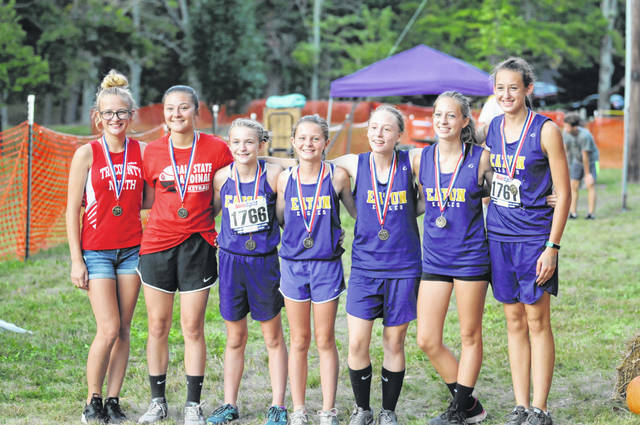 EATON — Eaton’s boys and girls cross county teams each claimed county titles at the Preble County Meet on Tuesday, Sept. 18 at Fort. St. Clair Park. 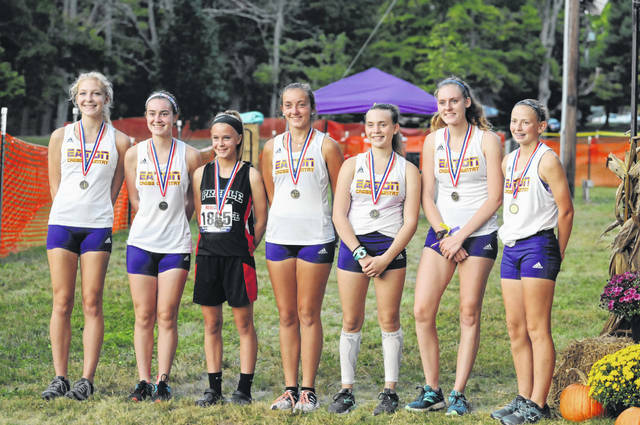 The girls team had nine of the top 10 placers and finished with 16 points. Preble Shawnee was second with 53 and Tri-County North was third with 70. Twin Valley South did not field an entire girls team. For the boys, Eaton also had nine of the top 10 spots to finish with 17 points. Twin Valley South was second with 51 and Tri-County North was third with 74. Preble Shawnee did not field a full team. National Trail did not participate in the meet due to a death of a student within the school district. Eaton freshman Allison Mowen was the individual county champion with a time of 21 minutes, 58.59 seconds. She was followed by teammates Claire Meyer (22:23.0), Briana Baker (23:19.24) and Brooke Caplinger (23:32.38) in second through fourth place. Preble Shawnee’s Hannah Myers was fifth in 23:44.17. Rounding out the top 10 was Eaton’s Rachel Buckler (24:01.73), Cari Metz (25:12.31), Ali Owens (25:15.83), Arica Hamilton (25:28.64) and Ashlynn Conley (25:32.90). Finishing in 11th through 15th place was Preble Shawnee’s Caiden Duskey (25:38.45), Eaton’s Laura Clyburn (25:55.65), Twin Valley South’s Isabella Mills (26:25.46) Tri-County North’s Addie Singleton (26:29.32) and Eaton’s Elaina Maynard (27:31.25). On the boys side, Eaton’s Alex McCarty won the meet with a time of 17:10.90. He was followed by teammates Alex Newport (17:13.96) and Jack Bortel (17:19.18) in second and third place. Twin Valley South’s Kyle Saul was fourth in 17:52.58. Rounding out the top 10 was Eaton’s Cole Bulach (18:02.84), Dylan Sudding (18:11.45), Todd Coates (18:13.18), LeKendric Brown (18:36.67), KeAnthony Bales (18:45.06) and Ben Brewer (18:49.23). 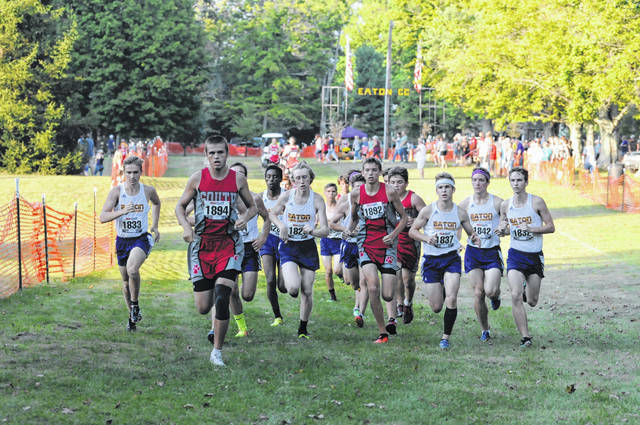 Placing 11th through 15th was Tri-County North’s Brandon Smeltzer (19:09.66), Eaton’s Austin Kopf (19:34.61), Eaton’s Gideon Smith (19:42.81), Twin Valley South’s Brandan Wright (20:05.76) and Twin Valley South’s Seth Craft (20:06.80). Eaton’s junior high girls placed first with 15 points. 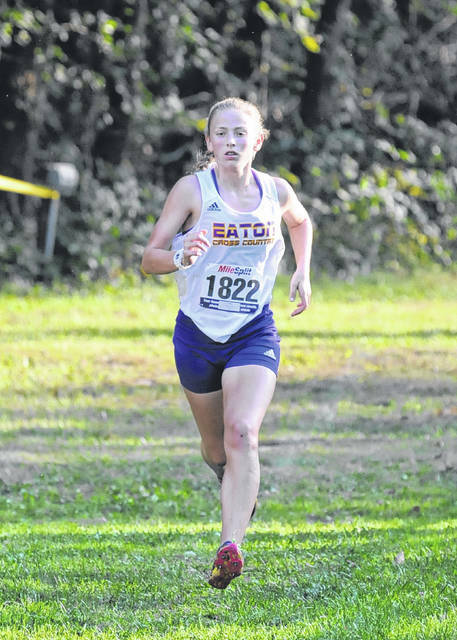 Kiera Elliot was the county champ with a time of 13:48.23. Preble Shawnee won the junior high boys race with with 37 points. Eaton was second with 41 and Twin Valley South was third with 44. Eaton’s Kolby Hamilton won the race in 12:07.62. Preble Shawnee’s Mason Shrout was second in 14:47.30.
https://www.registerherald.com/wp-content/uploads/sites/41/2018/09/web1_countyxc5.jpgEaton’s Alex McCarty placed first at the Preble County Cross Country Championships on Tuesday, Sept. 18. 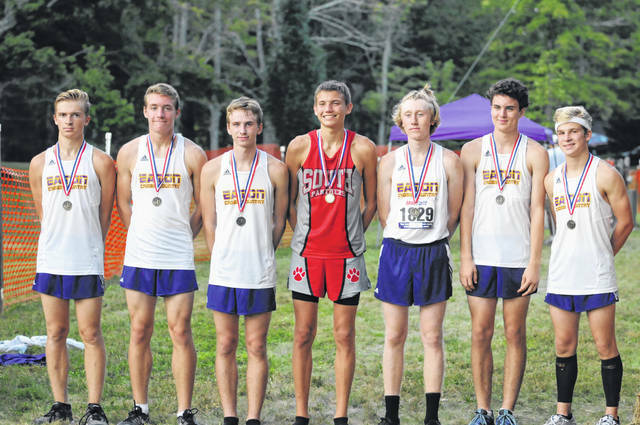 The Eagles placed nine runners in the top 10 win the meet with 17 points. 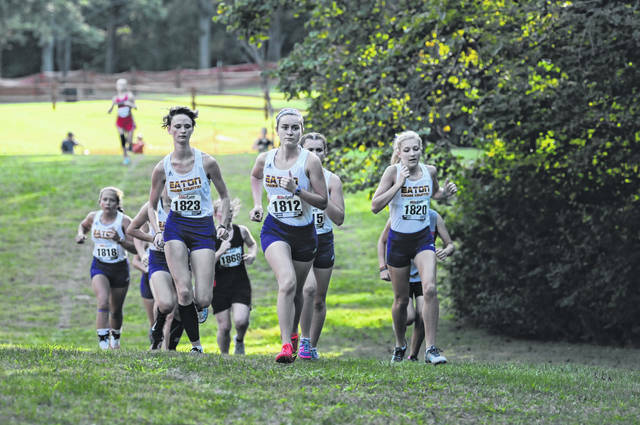 https://www.registerherald.com/wp-content/uploads/sites/41/2018/09/web1_countyxc7.jpgEaton’s Allison Mowen placed first at the Preble County Cross Country Championships on Tuesday, Sept. 18. The Eagles placed nine runners in the top 10 win the meet with 16 points.